Lined up to punt with the prospects of seeing a big lead slip away for the third straight game, Rams head coach Jeff Fisher called for a fake punt deep in Rams territory on 4th and 3 from their own 18. Fail and it would set the Seattle Seahawks up for a chip shot field goal. Instead, punter Johnny Hekker’s pass to Benny Cunningham turned into an 18 yard gain and a first down. The Rams were able to run out the clock and secure their 28-26 victory after a mad comeback from Russell Wilson. Special teams played a big part in the Rams win. Stedman Bailey had a 90-yard touchdown on a trick return that fooled the Seahawks into thinking the ball was punted on the other side of the field, and Cunningham had a 75-yard kickoff return that set up an early touchdown for the Rams. The Rams had a 21-6 halftime lead, but Wilson rushed for 106 yards on seven carries and threw for two touchdowns while going 23 for 36 for 313 yards. The Seahawks outgained the Rams 463-272. 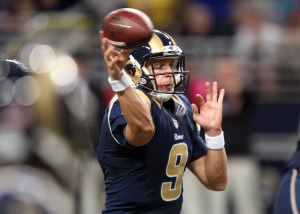 Austin Davis was 18 of 21 for 152 yards and two touchdowns with no turnovers. Tre Mason rushed for 85 yards on 18 carries and Cunningham led the team with five catches and 46 yards.